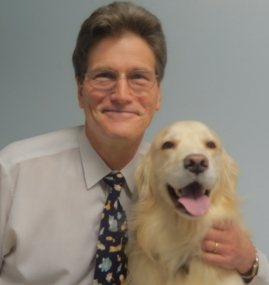 Meet Our Veterinarian and his support team of dedicated staff. 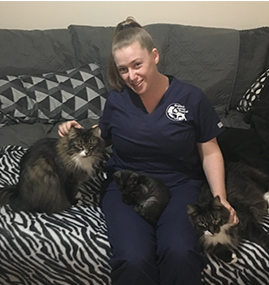 As a veterinarian, I especially enjoy surgery, educating owners and children on how to keep their pets healthy, the fun of puppy and kitten visits, and making elderly patients feel like puppies and kittens again. I have had post graduate training in endoscopy, ultrasound, laser surgery and reptile medicine. I am proud to be a member of the Noblemen, a philanthropic organization which raises money for special needs children in the Tidewater area. Additionally, I helped to form the NoblePets branch of the organization. I am a member of the American Veterinary Medical Association. 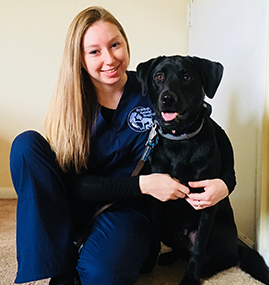 I am on the board of interviewers for prospective veterinary students at Virginia-Maryland College of veterinary Medicine, as well as being a mentor to two current veterinary students. When I'm not working at the hospital, or working at home assisting my wife and my son in their duties as local wildlife rehabilitators, I love to surf fish and I enjoy writing. I recently finished my first Fantasy novel, which I hope to have published. We have a Golden Retriever named "Chloe". 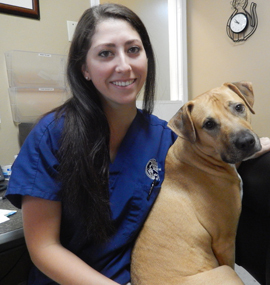 I have the most caring and amazingly wonderful staff members here at Birdneck Animal Hospital. I am very lucky to be surrounded by such a fantastic crew. Please feel free to stop by with or without your pet to meet us. I am a native of Virginia Beach and a Class of 2013 Alumni of Old Dominion University, where I received my B.S. in Biology with a Sociology Minor. 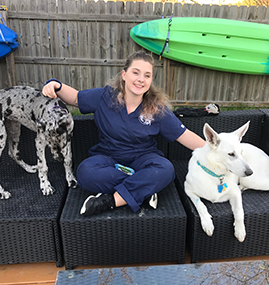 I am also currently studying to be a veterinary technician. 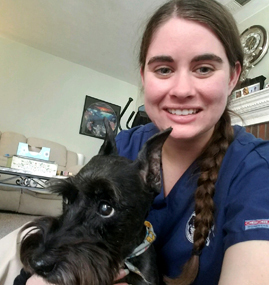 I love being a part of the Birdneck Animal Hospital team because I get to meet so many new clients and their furry (and some not so furry) children. I enjoy being around animals of all species and currently have many of my own. I have three dogs (Monte, Potain and Roxy), four cats (Lucy, Lady, Yoda, and TJ), and a bearded dragon named Fred. I do however have two dogs-Penny and Potain. I was born in Naples, Italy and moved around a few times until my dad retired from the Navy here in Virginia Beach. For as long as I can remember we have always had animals and I loved taking care of them. Ever since I was little I knew that I wanted to help people take care of their animals too. 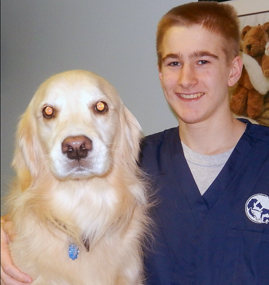 I am so thankful for this opportunity that Birdneck Animal Hospital has given me. I love working with these animals and their families. I have a white German shepherd puppy named Jasmine and I hope to grow my furry family soon. Growing up as a veterinarian's son, I have always been around animals. When we moved to Virginia Beach, I wanted to become even more involved in the animal world. I started working in the hospital as a summer job in high school. Also, I have a permit to do wildlife rehabilitation, which has given me an opportunity to meet and care for new kinds of animals including opossums, squirrels and raccoons. I love working at the hospital, and hope to eventually follow in my dad's footsteps and become a veterinarian. Growing up in a military family, I moved around a lot when I was younger, but one thing that stayed the same was my love for animals. I love working at Birdneck Animal Hospital because I get to meet some new furry friends. I am an alumni of Old Dominion University's class of 2015 with a B.S. in Biology. I have a miniature schnauzer named, Monte. I was born and raised in Florida and am new to the Virginia Beach area. I have never worked in a veterinary clinic before, but I am in love with it! I am so thankful for Dr. Johnson and the wonderful ladies here for making me feel at home. I currently have a dog whom I love dearly named, Dudley. I was born in California and moved to the Virginia Beach area when I was little. I have never worked with animals before and I can say I absolutely love seeing everyone's furry friends. I have always loved all kinds of animals. I had many dogs growing up and now I have two lovely dogs, Zoi and Phish, and a sweet baby boy chinchilla named Gizmo. I am originally from Long Island, NY and moved to Virginia in August 2017. 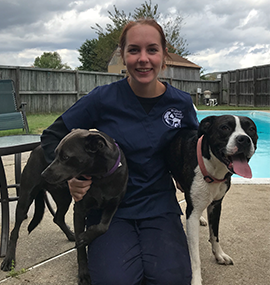 I have always loved working with animals and started my path toward veterinary medicine while working with abused dogs back in NY. While I have not finished my degree yet, I hope to finish in the next year and get license to be an LVT. 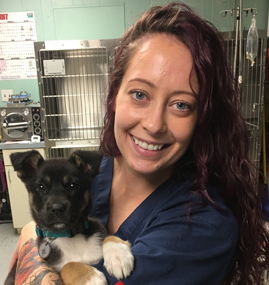 While looking for jobs in the veterinary field here in Virginia, I came across Dr. Johnson and was impressed by his work ethics as well as the technology he uses and couldn't be happier to have the opportunity to work and learn from him. I am from Boston Massachusetts and just recently moved to the Virginia Beach area. Growing up I always had one or more dogs so my love for animals started at a very young age. I currently have a super hyper Black Lab Mix named Turbo, who loves hiking and cheering on the Patriots with me!